How many homeowners have dreamed of extending and enhancing their kitchen or home in some way, only to be put off by the thought of careless cowboys and unqualified kichen fitters creating more havoc than haven? You won’t find that with England's Finest. And that’s a promise! I'm very serious about delivering exceptional service at all times and I pride myself on offering only the highest quality products, fitted by skilled tradesmen. I understand that it means so much when you finally find a company who you feel you can trust to do the job properly – first time and every time. It also makes a huge difference if workers are punctual, courteous, considerate and careful with your possessions. My dedicated team will fit your new addition to meticulously high standards. They’ll work with maximum respect for your property and with minimum disruption to your home life. A properly planned and fitted home improvement will add lasting value to your most valuable possession. That’s the way it should be. So that’s what I do. It’s as simple as that. And that’s why you should choose England's Finest – you won’t regret it. England's Finest offers a range of kitchens specifically designed to meet the needs of modern living, complete with a full range of accessories, built-in appliances, work surfaces, sinks and taps. 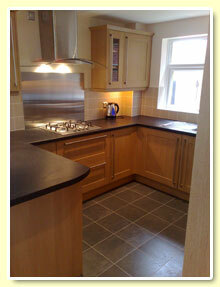 England's Finest kitchens are available in a range of traditional, classic and contemporary styles. The plan is then sent to me at England's Finest where I will put together a professional quotation, this is then sent to you along with the CAD drawings for your approval. Its then just a case of booking the team to complete the dream!